The Cycle of Fourths (a.k.a. 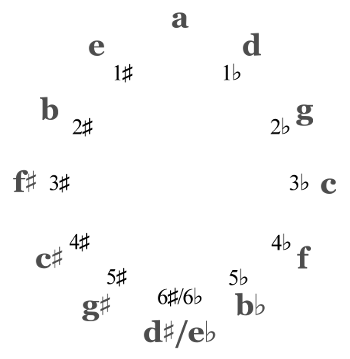 “Circle of Fifths” or “Cycle of Fifths” or “Circle of Fourths”) is a representation of all 12 notes in the chromatic scale, arranged into a circle. It’s most commonly used to easily find the notes in any major or minor key, but it can also give the student a solid intuition of chord progressions. On top of that, it’s a great exercise tool for learning scales and other concepts in all 12 keys (as I’ll demonstrate in Part 3 of The Mother of All Major Scale Exercises). The pattern you’ve created will repeat after that final E, as many times as you’re willing to write it out. But it’s easier to put those notes in a circle and follow the steps clockwise. The fourth note is five frets higher than the root. The interval from E to A is a fourth. Now this part is important: A distance of five frets between any two notes is a perfect fourth interval! We can find the fourth of any note by ascending five frets, or five half steps. We can do it over and over, like we did to create the chromatic cycle above. Starting with E again, A is the next note. Five half steps above A is D. Five half steps above D is G.
Look familiar? Those are the lowest four strings on your guitar. Indeed, if you confine yourself to those four strings (leaving out the tuning trap between the G and B strings), you can find a fourth above any note by moving to the next string on the same fret. The third fret of the E string is G, the third fret of the A string is C, G to C is a fourth. Let’s arrange it in a circle again, this time rotated so that C is at the top. (Music theory tends to revolve around C, since the C major scale contains no sharps or flats.) Ladies and gentlemen, this is the Cycle of Fourths! You can construct another cycle with the perfect fifth interval. This interval is seven frets, the distance between the root and the fifth note of a major scale. And that was the Circle of Fifths. Notice that this is simply going counterclockwise around the Cycle of Fourths. 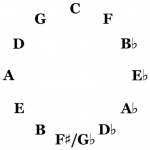 Whether you call it a “circle” or a “cycle,” whether you use fourths or fifths, you will get the same collection of notes. Whichever mirrored version you choose, moving one way will be fourths and the other way, fifths. Note that an ascending perfect fourth is equivalent to a descending perfect fifth, just an octave apart. Moving five frets up, you will be exactly an octave higher than if you had moved seven frets down (12 frets in an octave; 5 + 7 = 12). Likewise, an ascending perfect fifth is equivalent to a descending perfect fourth. That’s why the fourths circle and the fifths circle are mirror images of each other. 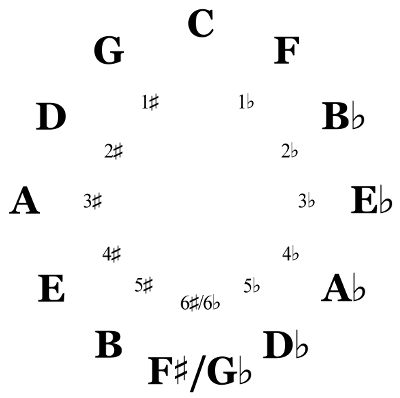 The most common name for this concept is “Circle of Fifths.” And it’s most common to see that wheel of notes arranged with ascending fifths going clockwise: C, G, D, A, etc. However, I prefer “Cycle of Fourths” for a few reasons. Chord progressions tend to move in ascending fourths (descending fifths), more often than any other interval. Try a simple chord progression in the key of G: G C G D. Repeat it a few times. All three of these chord roots are right next to each other on the cycle. The strongest motion between any of these chords, the biggest demand for resolution, is from D to G. That direction is clockwise on the Cycle of Fourths. This motion of chord roots in fourths happens most often in jazz and classical music. For example, the first few chords in Charlie Parker’s “Confirmation” are F6 Em7b5 A7 Dm7 G7 Cm7 F7 Bb7. Take a look at the chord roots. From E to Bb, they move strictly in fourths. This kind of chord root motion, usually not this long, is more common in jazz than the electric guitar is in rock. Have a few more examples from the rock realm. See if you can spot the chords’ root movement along the Cycle of Fourths. 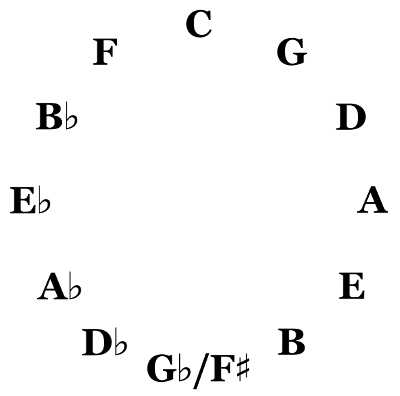 EDIT: Regarding “Circle” vs. “Cycle,” the latter implies the motion seen in all these chord progressions, while the former seems more like a static geometric tool. I’m not the only one using this term. If you know some of your major scales, you might have noticed something peculiar about the Cycle of Fourths. They’re all clumped together. C major is the easiest to see; it contains C D E F G A B, no sharps or flats. Look at the cycle. There they are, all in a row, jumbled into a funny order, but all together. Now, if we look at F major, that contains F G A Bb C D E. The B changed to Bb, and now the F major scale is all together too. Look at G major: G A B C D E F#. All together! This will work with all 12 major scales. Find the root on the cycle, add one note clockwise and five notes in the other direction, and you’ve got a major scale. This works just as well with minor scales. 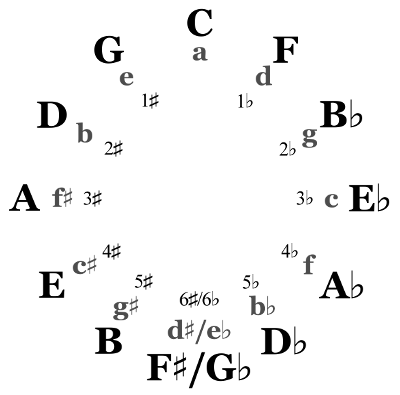 A minor contains A B C D E F G. E minor contains E F# G A B C D. Take any root on the cycle, add four notes clockwise and two notes counterclockwise, and you’ve got a minor scale. 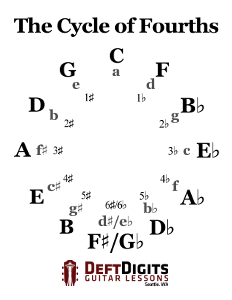 Every major or minor key has a key signature, which tells you how many sharp notes or flat notes are in the primary scale for that key (a D major scale for the key of D major, a Bb minor scale for the key of Bb minor, etc.). These key signatures can be difficult to memorize, unless you visualize them on the Cycle of Fourths. The key of C major has no sharps or flats, which is why we put it at the top of the cycle earlier. As you move to the right, one flat is added to the key signature with every step. As you move to the left, one sharp is added to the key signature with every step. We can do the same thing with minor keys, only now we situate A at the top, because that’s the only minor key with no sharps or flats. 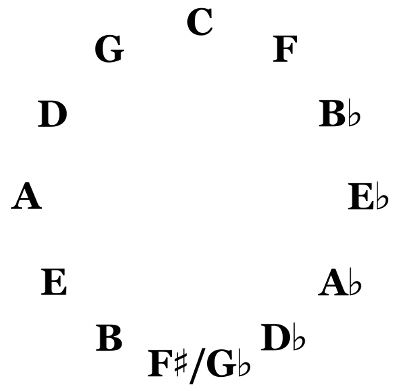 These can be combined into a single diagram, with the minor cycle spun 90 degrees to match key signatures with the major cycle. The best way to memorize the cycle is to think of it as a clock. C lines up with 12 o’clock, F with 1 o’clock, Bb with 2 o’clock, and so on. (True story: I own a Cycle of Fourths Watch.) Ignore the minor version for now; you can bring it in later. 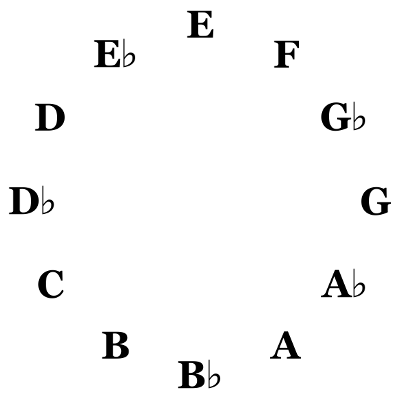 Note your landmarks at 12, 3, 6, and 9: C is at the top, Eb is directly to the right, F#/Gb is at the bottom, and A is directly to the left. Get those down first. The remaining two notes between each of those are best memorized by reciting the cycle to yourself and getting used to the sequence. Looking at only the seven natural notes in the cycle, you get a word and an acronym: BEAD, GCF. I remember GCF as “Greatest Common Factor” from grade school math. That has no relevance here; it was just a very familiar collection of letters. You might not have that same connection, but it helped me learn the cycle in my early musical days. As you move beyond F into the flats, they follow the same initial pattern before falling back on B: Bb Eb Ab Db Gb. In your spare time, recite the entire cycle to yourself a few times. Use a diagram when you need it. Getting that sequence rolling off your tongue will help you fill in the blanks around the four landmarks. “C major, A minor, no sharps or flats; F major, D minor, one flat; Bb major, G minor, two flats; Eb major, C minor, three flats,” etc. When you get tired of going around and around clockwise (don’t be fooled; you will get tired of it), you can try going counterclockwise or pinging around the cycle in other ways (i.e. 1 flat, 1 sharp, 2 sharps, 2 flats, 3 flats, 3 sharps, etc.). The most obvious benefit of knowing the Cycle of Fourths is that you’ll be able to instantly translate between major key, key signature, and relative minor key. You’ll also be able to recognize familiar bits of chord progressions when the roots move in fourths. If you haven’t memorized every note on the guitar yet, this will help you do it, because, tuning trap notwithstanding, moving one string higher on the same fret as any given note equates to moving one step forward on the cycle. And one string lower equates to one step backwards on the cycle. Another way to use the cycle is in any kind of exercise that you need to practice in all 12 keys. Suppose you’re working on the old faithful minor pentatonic box, and you want to move that shape around and spend some time on each of the 12 possible roots. You could move it chromatically, one fret at a time, but that’s a very predictable pattern. Each time you move, the new position is barely different from the previous. If you move based on the Cycle of Fourths, the jump between each step provides some welcome variety. If you start with A minor pentatonic at the fifth fret, you’ll move to D minor pentatonic at the tenth fret, then G at the third, C at the eighth, etc.